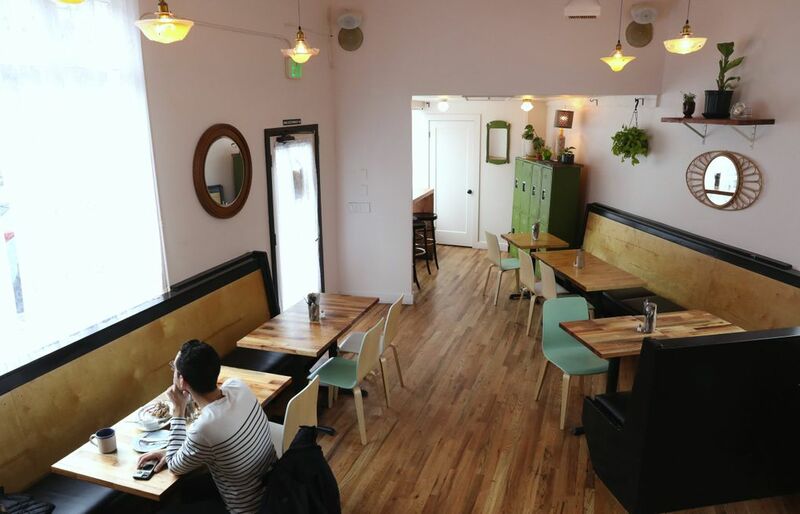 Seattle’s new Dacha Diner on Capitol Hill has so many really, really good things to eat that it’s difficult to know where to begin. You might want to try the latkes first, for they are perfect: Made with a batter of potato, onion and matzo meal, they’re lacy-golden-brown crisped on the outside, soft to the point of melty inside, exactly salty enough, served nice and hot. Things can take a little time at Dacha Diner, but they come at the temperature that makes ancestors somewhere cluck approvingly while watching you eat it all up. 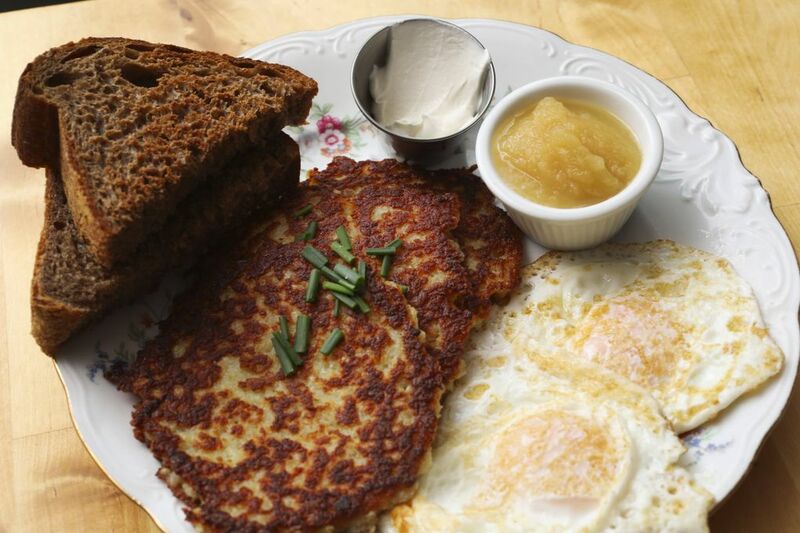 An order of three potato pancakes, two eggs — mine were ideally over-easy — and two thick triangles of beautiful wheaty-rye toast, plus, of course, sour cream and applesauce, costs $10. If you just want a side of latkes, that might be the best five bucks you can spend in Seattle right now (unless you’re skilled at making them, in which case, may I come over?). Dacha describes its menu as “Eastern European & Jewish cuisine.” The place is run by the trio behind The Independent Pizzeria, an undersung local hero of the form in Madison Park. 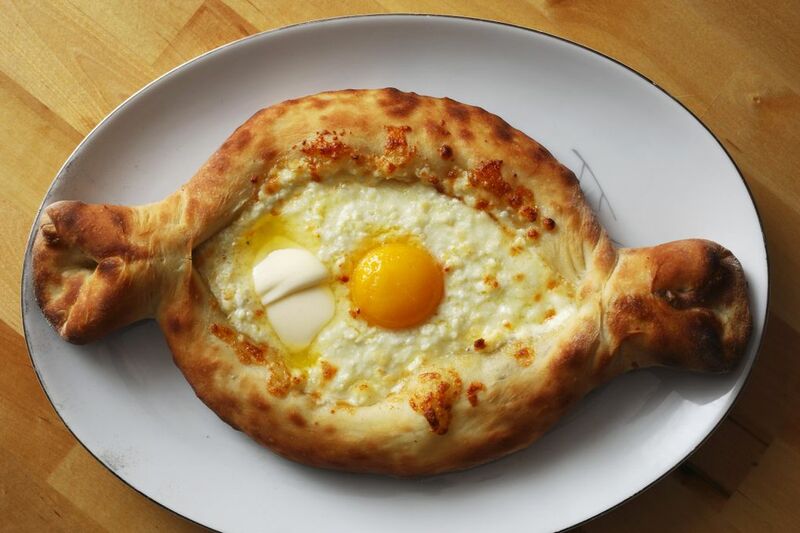 Given their skill with that, then, arguably, what you ought to go eat immediately is Dacha’s Adjarian khachapuri, a traditional Georgian cheesy-bread-boat that may, if such a thing is possible, represent an improvement upon pizza. Dacha’s version of Adjarian khachapuri is as spectacular as something so homespun can be. The crust is airy inside, burnished-crunchy in places outside, substantial but light, with exactly the right chew. The cheese is fresh-tasting, slightly tangy and fluffy, the opposite of a smothering mozzarella-blanket, and enriched with both a bright-yellow egg yolk and a pat of melting butter. Mix the egg into the cheese with the tines of a fork, tear off the little bread-handles at either end, and dip them into the gorgeously golden slurry. Then when you eat the rest, you will discover that the cheese goes up under the folded edges of the crust, like something you saw in an ad for Domino’s and fervently wished could be actually good. Dacha’s Adjarian khachapuri costs $13 and is substantial enough to share. Right now, I am eating leftover khachapuri that I stuck in a hot oven for 10 minutes, and I could not be happier (sorry, keyboard). During dinnertime hours (Wednesday through Friday only), they serve other versions, like maybe one with chard, or one topped with soujouk (or sujuk), a Balkan cured sausage from George’s (also an undersung local hero). These are $13 each, too, and could probably cost half that much again more. But if brisket is special to you, begin with that at Dacha — a big plate, pot-roast-tender, with mashed potatoes is another bargain at $13. But wait; before that, you should probably have a small bowl of borsch ($4, and really medium-sized; they hold the T, to be properly Russian, as “borscht” is a German spelling). Dacha’s borsch is chunky and rich, with a tiny vinegar-and-lemon bite to even out the sweetness of the beets. You can, and probably should, if you’re meat-inclined, add big chunks of beef ($3 extra). 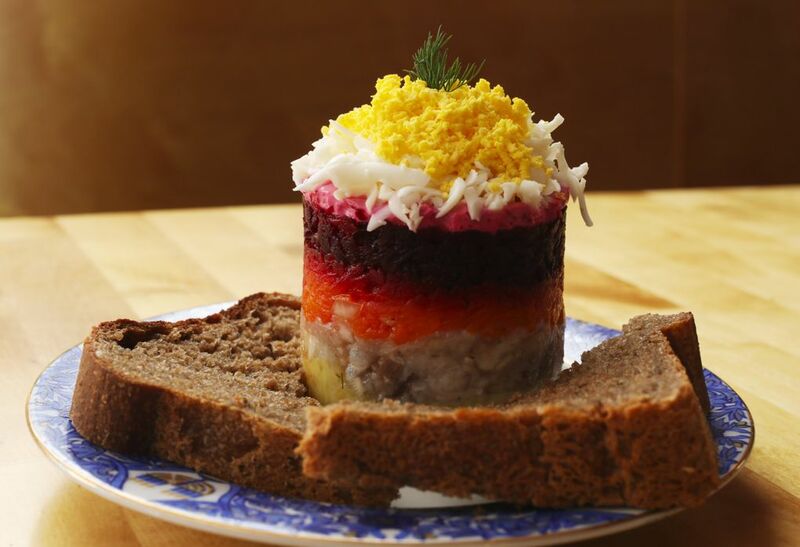 Dacha also makes the multilayered Russian beauty of a dish known as herring under a fur coat, popularized hereabouts by Portland restaurant Kachka — you probably want this vibrantly stacked salad for your Instagram right away. Also, you should see how the various vegetables’ team effort to tame the herring works for your palate, because this could be your new summertime standby lunch, for only $10. And other heretofore practically unknown-to-Seattle dishes must be taste-tested, including, in the dumpling department, both pelmeni ($10) and vareniki ($9). And if the Reuben is on the specials board, well … Made with Dacha’s thick-sliced but unheavy wheat-and-rye bread, it overflows with rosy meat and creamy-pink, house-made Russian dressing, and it’s a ridiculously generous portion for $10. I had one — well, half of one, with half to-go for later — at lunch o’clock on a Wednesday when Dacha’s funny little triangle-shaped building was filled with springtime sunshine, filtered through curtains made of white lace. Through one window, a spindly tree threatened to burst into pink blossom; across the street, old-school Capitol Hill favorite The Crescent looked grungily great, its rainbow and American flags fluttering. A few bites in, I reflexively thought, Dad would love this sandwich, and because he’s gone, and also because Dacha’s bread reminds me of the marvelous brown bread that our neighbor used to bake where I grew up on the other side of Capitol Hill, I cried a little bit while eating it. It’s a really good Reuben. MAYBE IT’S BECAUSE I’m the kind of person who will start crying because of a sandwich, but there’s something about Dacha Diner that feels truly special to me. During the day, it’s order at the counter, but whoever’s there is always extra-nice; the plates and mugs are mismatched, which somehow matches the comforting food. The decor might be described as extremely restrained, unusually airy old-style Eastern European apartment: pretty etched-glass light fixtures, a mirror here, a plant there, the white lace. People linger after lunch, talking of this and that. If you catch co-founder and general manager Tora B. Hennessey at the cash register and you hesitate about a pronunciation, prepare to be anti-shamed. The “k” in khachapuri is sometimes silent, but sometimes not, she’ll explain, depending on who’s saying it; do what you feel, she’ll tell you. “I’m not here to police anyone!” she might say, laughing. Hennessey told me how the family of family-run Independent Pizzeria and Dacha Diner came to be. She and Tom Siegel met in 2006 at a memorial service for what became known as the Blue House Massacre on Capitol Hill, in which they’d lost a mutual friend. They fell in love, then opened The Independent Pizzeria in 2010. They found Joe Heffernan via an ad on Craigslist in 2012 and brought him aboard, intending to eventually give him a small percentage of profit-sharing; then, after they moved for a time to care for Siegel’s ill father, they decided to gift Heffernan half of the business. “We wanted him to feel he had an equal stake,” Hennessey simply said. Heffernan’s girlfriend, Ruth Bryan, who spent part of her childhood in Russia, works at The Independent Pizzeria, too; Dacha’s lovely brown bread is his recipe with help from her, a combination of an ubiquitous Russian loaf and one from storied San Francisco bakery Tartine. Siegel, who is Jewish, grew up in New York; he also brings the particular culinary expertise of having run a deli and catering company in Prague. His grandfather is from Russia — specifically Sevastopol, Crimea. The menu, Hennessey related, is based on what Siegel grew up eating and the foods he enjoyed while living and traveling throughout Eastern Europe. 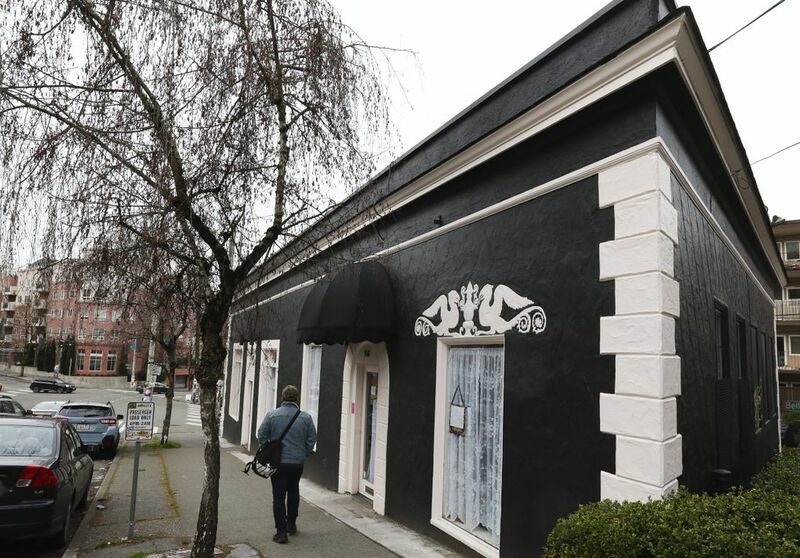 They’d been thinking about something like Dacha for a long time, Hennessey said, “because there was a serious lack of Jewish and Eastern European food in Seattle. “This food is a way of honoring his grandparents,” she said. 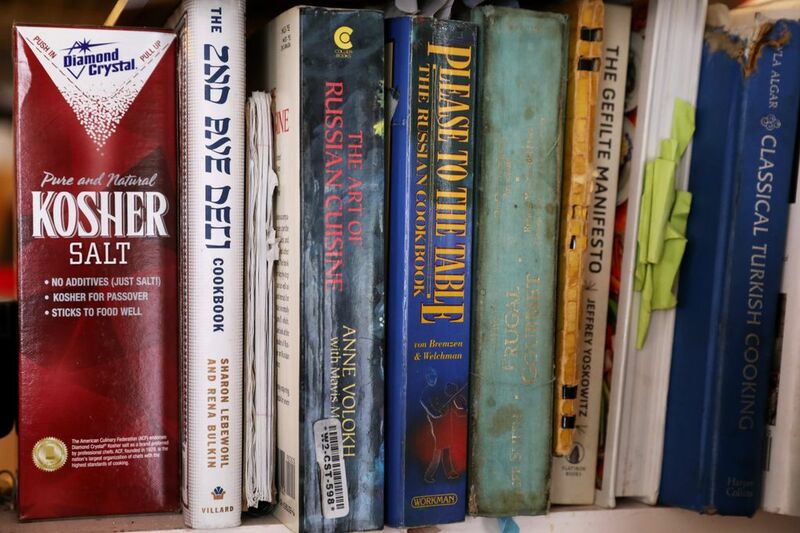 Before opening Dacha Diner, all four friends took a trip to Eastern Europe together to do a lot of eating research, during which Heffernan and Siegel also trained with chefs, bakers, grandmothers and winemakers. “We do consider us to be a family, even if it’s not traditional. We all love each other very much,” Hennessey said. The fact that it’s a chosen-family affair, with everybody working a ton, explains Dacha’s squirrelly hours. Things might go a little sideways if they’re down a person one day — longish waits for food, a wrong order delivered — but Dacha’s only human. If your toast isn’t buttered, you don’t feel bad asking for some; if the onion in your Georgian salad tastes very sharp instead of sweet, you think, well, it happens, and it also only costs $5. The humane price point — including $2 coffee with free refills and $6 glasses of well-chosen wine — means those of less-than-New-Seattle means can afford to hang out, means that most everybody feels welcome. Dacha Diner is a place in our city that feels like a new classic, like a gain of a wonderful, low-key, neighborhood-and-beyond place instead of yet another loss. When you’re here, you really do feel like family, and not in a focus-grouped-and-trademarked way. It’s just the kind of food the whole family of humanity deserves: profoundly comforting, inexpensive but of excellent quality, and made — clearly — with love.